Moving to Manhattan, but don't know what kind of apartment you should look for? Should it be a charming prewar, a snazzy new condo, or a cozy brownstone? How about a spectacular loft? And where do you want to live - near work, in a happening area, or in a quiet family neighborhood? And what can you afford? Don't worry, we're here with the answers. There are primarily two kinds of apartments for sale in Manhattan, coop and condos. The vast majority (over 80%) are coops, while the rest are condos. They have different advantages, and you should choose the best one for you. With a cooperative apartment you actually own shares in a corporation which gives you a proprietary lease to the apartment. Your monthly maintenance charge pays all costs to run the building, your real estate taxes, heat, water - everything but electric. Owning a coop can be a little restrictive: you must be interviewed and approved to purchase, any alterations must be approved by the board, as must any sublet and resale. They may or may not take pets. There are usually financing restrictions as well; typically a coop will not let you finance more than 75%. The plusses are generally a lower price than a condo, and control over building tenancy. A condominium is a fee type of ownership, and you actually own the four walls of the apartment as well as pay your own real estate taxes. Condos are very flexible: you can buy them in any name you want (i.e. corporate ownership, etc. ), there is a less intrusive application process and rarely an interview. The only way a condo can reject a sublet or sale is to exercise their right of first refusal by matching the sale or rental price. Large individual townhouses do exist in Manhattan. They are generally 3-4 stories high and 17-22 feet wide. A typical townhouse is anywhere from 3000-6000 square feet, and will often have a private garden. Some are single family homes, and some have rental apartments in them that can generate income for the owner. Prices start at about $3,000,000 and go upward from there. Yearly real estate taxes average 1% of the purchase price. There are three basic styles as well as three basic types of apartments here. The three main types are Pre-war, Post-war, and New Construction; the main styles are Highrises, Brownstones, and Lofts. Prewar apartments are those built before WW II. These are very desirable in Manhattan, because they tend to be built in the prime locations and have lots of charm and detail not found in postwars. Such elegant detail might include high ceilings, fireplaces, crown moldings, patterned hardwood floors, and thick plaster walls. Most prewars in the better locations have doormen. Postwar apartments are those built from1946-1980. They are typically large highrise buildings with doormen, underground garages, and often have great open city views. These are conventional spaces, with studio, one bedroom and two bedroom layouts that don't change much from building to building. They feature 8' ceilings, parquet hardwood floors, and galley style kitchens. Postwars are the most economical option, getting the most space for the least amount of money, and are very popular with first time buyers. Thanks to major tax incentives, there was a swell of new construction in Manhattan from 1983-1990 and again from 1996-today. This new construction is typically a highrise condominium. Though the 1983-1990 units may be slightly smaller than their postwar counterparts, they tend to offer high-end finishings (marble baths, private washer/dryers), and more building amenities (health clubs, pools, kid's playrooms). They also feature doormen and garages. As many were built close to the rivers that border Manhattan, several boast absolutely spectacular views. The newest developments focus primarily on larger, family sized apartments on the Upper East or West Side, while Tribeca, Soho, and Chelsea boast of dramatic new loft buildings with immense apartments by the world's leading architects and designers. Selling prices on these stunning homes can range from $1,500 to over $3,000 per square foot. These can be either prewar or postwar, and are typically 12-30 stories, with a doorman, laundry facility in the basement, and sometimes a garage. Other amenities might include a roof garden, bike room, and individual storage bins. Newer buldings may have a health club. 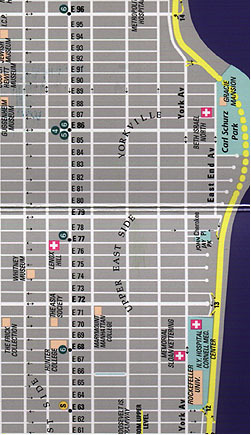 There are highrise buildings throughout the city, but the vast concentration is from 14th Street to 96th Street on both the east and west side. Larger buildings can be found on the avenues, while slightly smaller buildings would be found on the side streets. A brownstone is an apartment in a small 3-5 story building. Most brownstones were originally designed as single family homes in the 1800s, and have since been converted to apartments. Though room dimensions tend to be a little smaller (particularly the bedrooms), and closet space is tight, many adore the charm of their fireplaces, fancy moldings, and high ceilings. Ground floor units often feature large private gardens. Brownstones are too small to have doormen, but do have intercom systems for security. About half have some sort of laundry and open storage space in the basement which is shared by all owners. Those who prefer quiet spaces, tree lined streets, gardens, and privacy love brownstones. Brownstones are located primarily on the side streets of the East and West sides, in Greenwich Village and Chelsea. Lofts are residential apartments that were generally created out of former commercial buildings and warehouses. Though not in typical residential areas, they offer huge unconventional spaces that can be individually designed. Starting at about 1000 feet, they can be found as big as 5000+ square feet. Originally converted for use by artists, more and more executives have moved here to take advantage of the space and the close proximity to the financial district. Lofts are primarily found in the Soho, Tribeca, and Chelsea areas. They rarely have doormen, and the bedrooms are often dark, but they typically have soaring ceilings, their own washer/dryers and incredible storage. In addition, the last five years has seen a proliferation of high end designer lofts built with all the amenities of a typical residential building, such as garages, gyms, doormen, and children's play rooms. 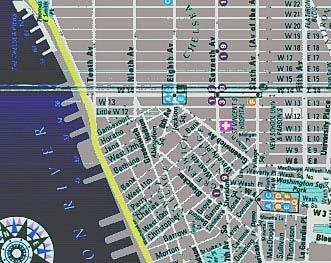 There are many different neighborhoods in Manhattan, all with a distinct flair and history. The best way to see which one you like best is to come and spend time here! The following is a brief description of some of our most popular neighborhoods. From 59th Street to 96th Street, bordered by the East River and Fifth Avenue, this is one of Manhattan's most popular residential neighborhoods. Residential amenities abound, including restaurants, shopping, good public schools, and "Museum Mile". Central Park is within a few blocks for all residents. Easy transportation to midtown and Wall Street via the 4,5, and 6 trains and express buses. Fifth and Park Avenues offer some of the most beautiful -- and expensive -- real estate in Manhattan, while the more affordable postwars and glamorous new construction condominiums can be found side by side from First Avenue to Lexington. From 23rd Street to 59th Street, bordered primarily by First and Eighth Avenues, this area has more of a mixed commercial flavor, bordering as it does on the Midtown business district. It is well liked by those who want to walk to work, or want a little hideaway just steps away from theaters, Carnegie Hall, and the Opera. The East side is popular as it is convenient to business and the United Nations. Prestigious Sutton Place is a Park Avenue-like enclave near the East River, while Gramercy Park is a charming square bordered by elegant buildings with keys to their own private park. From 60th Street to 96th Street, bordered by Central Park West and Riverside Drive, those who flock to this residential neighborhood love its active community life, close proximity to both Central Park and Riverside Park, the opera and theater at Lincoln Center, the Museum of Natural History, and the overall smaller scale and prewar styling. Impressive Central Park West is home to movie stars and power brokers, while others love the night life on Columbus Avenue and the shopping on Broadway, while others prefer the quiet of West End Avenue and its broad sweep of stately buildings. 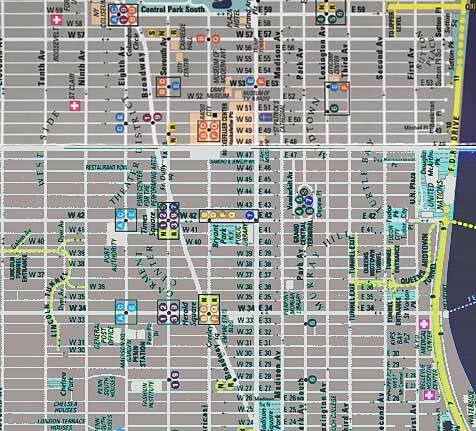 With two different subway lines going down Broadway and Central Park West, it can be easier and less crowded to commute than on the East Side. The easy access to both Riverside Park and Central Park makes it perfect for all those who love to run, bike, and rollerblade!). Well known as a hotbed of artistic and cultural thought, this active area reminds many of Boston, with its collection of smaller brownstone buildings and cobblestone streets. Hip stores and quaint restaurants rule here. While the area near NYU in the central village hums all night long, those seeking quiet charm go west of Seventh Avenue to stroll amidst landmark townhouses on quaint treelined streets. Chelsea is one of the city's hottest areas, due in part to its worldclass Sports and Film complex on the Piers, and its mix of small brownstones and huge lofts attracts a wide variety of Manhattanites. Soho ("South of Houston") and Tribeca ("Triangle Below Canal") are generally industrial areas, but over the last thirty years they have become extremely popular with those seeking oversized loft homes. Originally settled by artists seeking large studios, many of the wonderful old cast iron warehouses and factories have been gut renovated to create some spectacular residences. Some buildings maintain the restriction "artists only", but by and large those restrictions have eased and anyone can live here. Nearer to Wall Street and the financial district, it makes an interesting alternative to the more conservative Upper East Side. Soho is renowned for its spectacular upscale and trendy shopping, while Tribeca now hosts some of the world's finest restaurants. 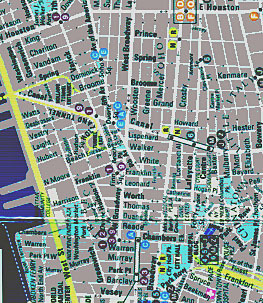 Upper Manhattan begins with Harlem (125th Street) and stretches all the way up to the northern tip of the island, where neighborhoods including Hamilton Heights, Audubon Terrace, Washington Heights, Hudson Heights, and Inwood have all found their way into the mainstream of New York Real Estate. Harlem is known for its brownstones and rich history; the Heights and Inwood have become housing destinations for families, professionals, artists and academics priced out of the downtown neighborhoods or simply looking for a little more nature and a little less bustle. Easily accessible by A Train Express and local 1 and 9 subway lines, these cozy neighborhoods feature pockets of real New York history, beauty and nature including the Apollo Theatre, the Cloisters Museum in Fort Tryon Park, and Inwood Hill Park. The predominant architecture of gracious pre-war and Art Deco co-ops make Upper Manhattan the perfect choice for those who want to live large at a reasonable price.